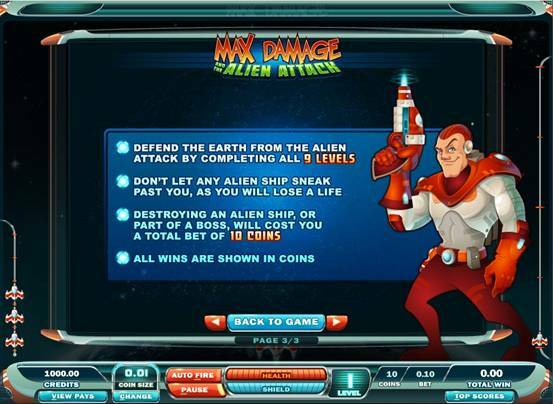 Max Damage and the Alien Attack the first in a brand new online gaming line. This casino slot game breaks convention and introduces online players to a new type of video slot as the first Arcade game in collection. 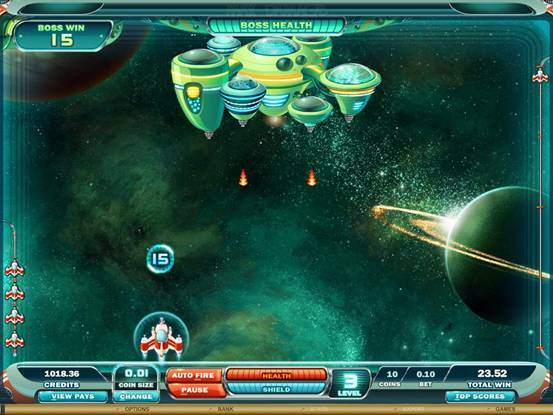 Players will find themselves flying a spaceship in an attempt to fight off Alien enemy ships. Jackpot City Casino's latest new game is really a revolutionary approach to online gambling that combines popular retro arcade-style action with today's most advanced technologies in quality graphics, sound effects, gaming power and rewards, and is sure to appeal to a wide range of players. Gone are Reels, Pay-lines Wilds, Free Spins and Scatters, and in their place are Freebies, Boosters, Upgrades, Lives and Levels in a thoroughly entertaining package that gives both rewards and tons of fun in MAX DAMAGE AND THE ALIEN ATTACK. This is the first in a new range of arcade style games that Jackpot City Casino will be presenting for players' pleasure in the future, giving an extra dimension of choice in the large range of gaming options already available on-site. 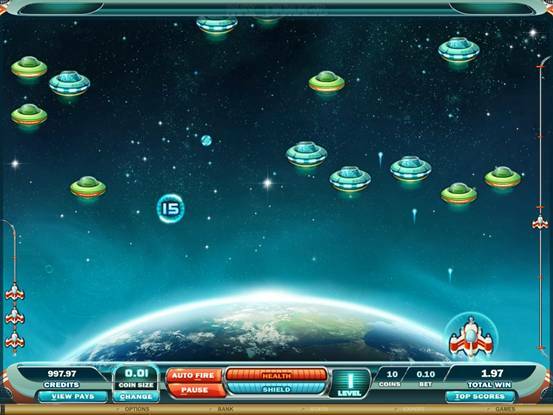 Arcade game fans will be immediately familiar with the colourful and vertically-oriented screen down which alien spacecraft advance toward the player's defending ship, which scores rewards and benefits based on the number of aliens destroyed over the 9 levels of the game. Once all enemies have been terminated, the player is rewarded and moves up to the next level. Players don't have it all their own way - as each level progresses, enemy alien ships fly on to the screen, and will either randomly fly closer to the player's ship or attack in formation, aiming to collide or return fire and end one of the 6 lives the player is armed with at the start. 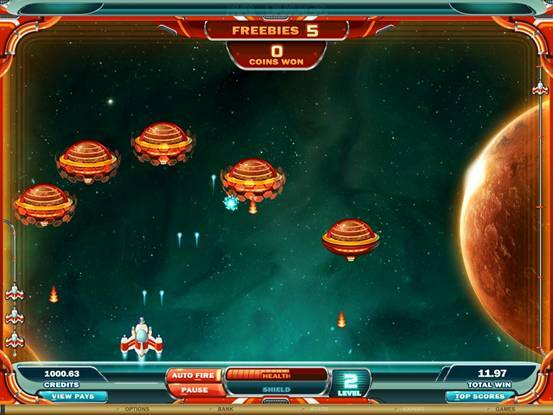 Freebies, upgrades, multipliers and benefits are available as the game progresses, giving players the advantage of freebies like missiles, Wormholes and nukes; firepower upgrades; and Health, Life, Damage and Shield boosters. Bigger pay-outs are achieved when the player manages to knock out the distinctive Boss ships at the close of levels 3, 6 and 9. Enhancing a player's reputation and bragging rights on the new game is a leaderboard which serves as a competitive plaque and displays the top player scores, along with the dates and ranking of different players' achievements. 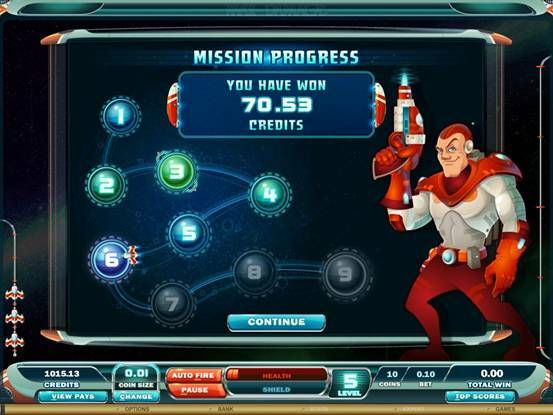 The most challenging level is level 9, but if the player is successful in blowing away the last Boss ship he or she earns a place on the leaderboard dependent on score. 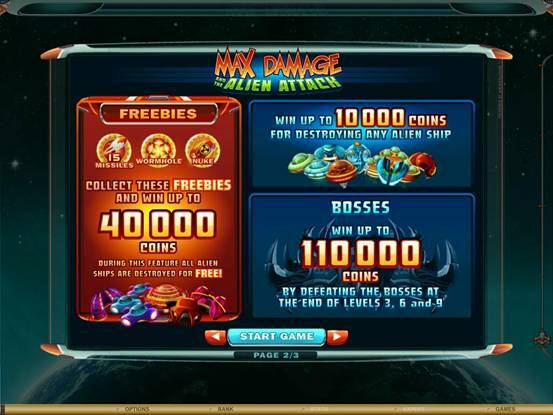 Max Damage and the Alien Attack really is a radical new and very appealing change from conventional online slot gaming, and is well worth a try...click over to Jackpot City Casino to climb into your spaceship and get into the thick of the action today!